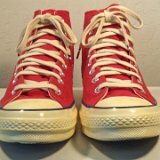 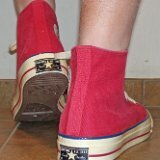 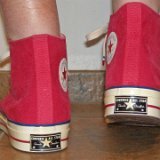 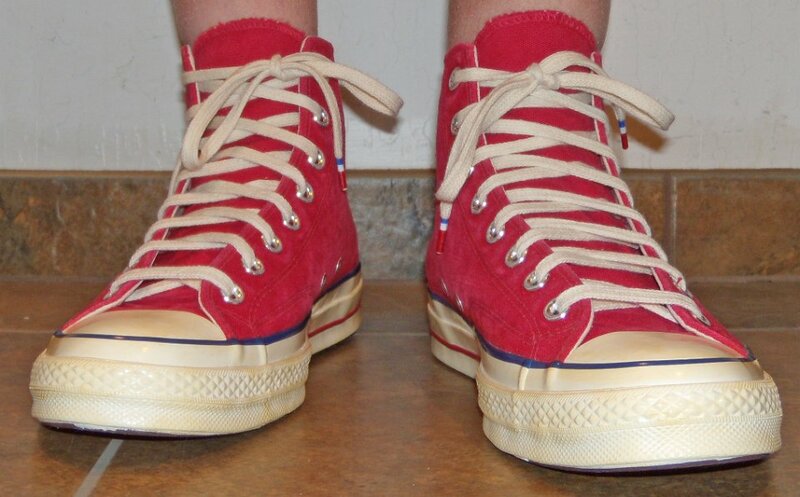 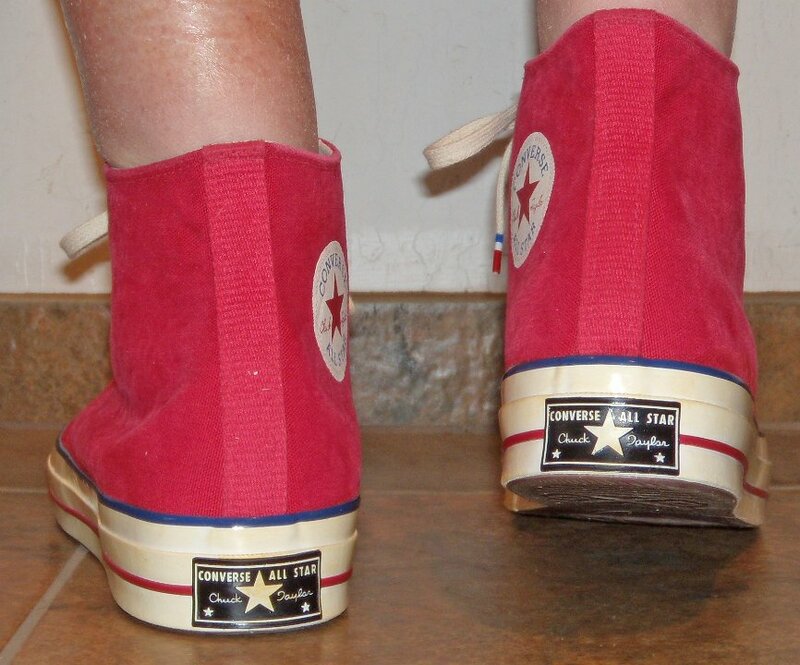 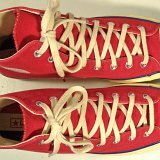 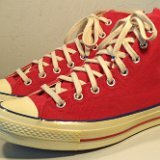 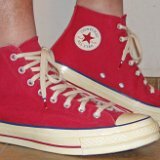 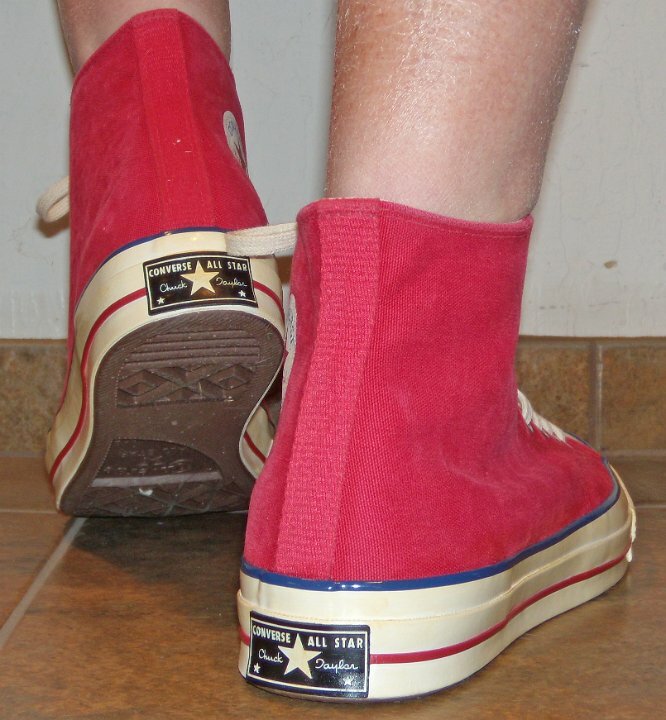 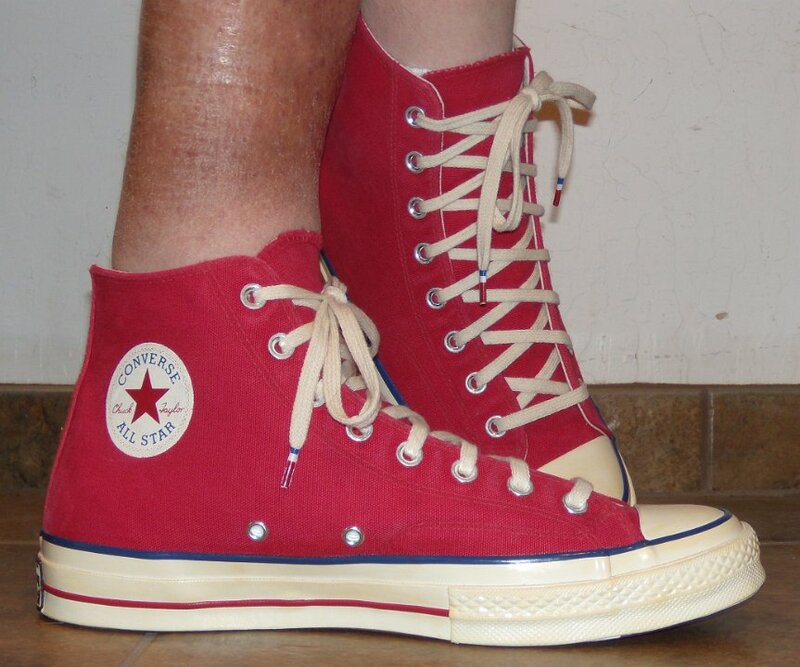 Photo gallery of a brand new pair of red Converse Chuck 70 Vintage Canvas high tops. 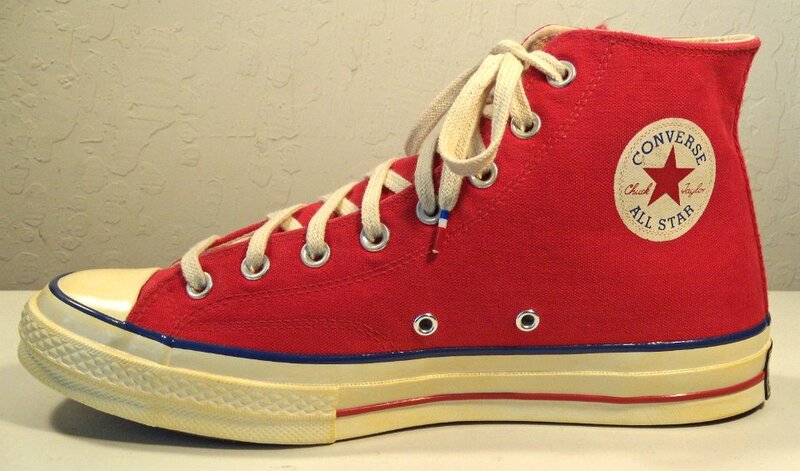 1 Red Chuck 70 Vintage Canvas High Tops Inside patch view of a right red Chuck 70 vintage canvas high top. 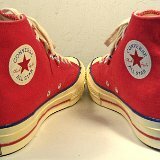 2 Red Chuck 70 Vintage Canvas High Tops Outside view of a right red Chuck 70 vintage canvas high top. 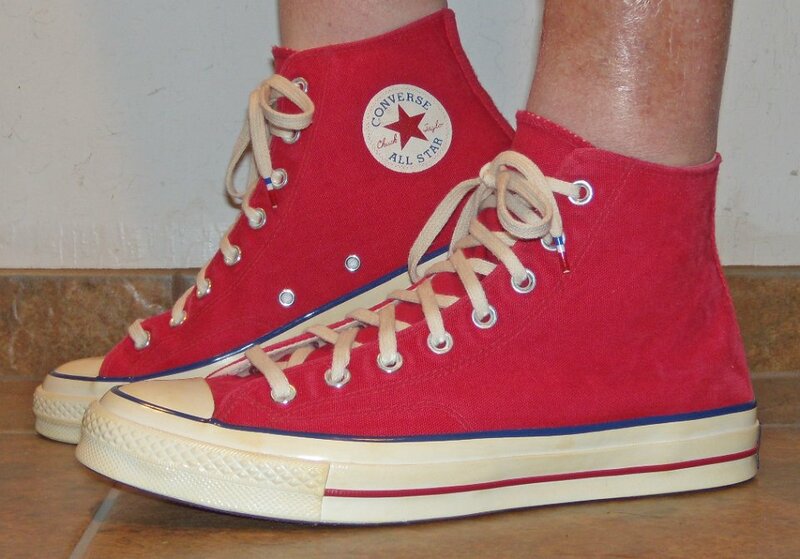 3 Red Chuck 70 Vintage Canvas High Tops Inside patch view of a left red Chuck 70 vintage canvas high top. 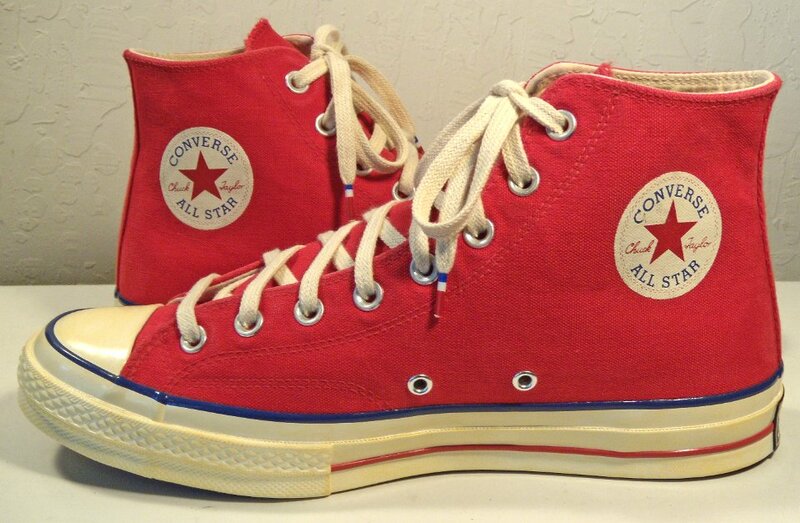 4 Red Chuck 70 Vintage Canvas High Tops Outside view of a left red Chuck 70 vintage canvas high top. 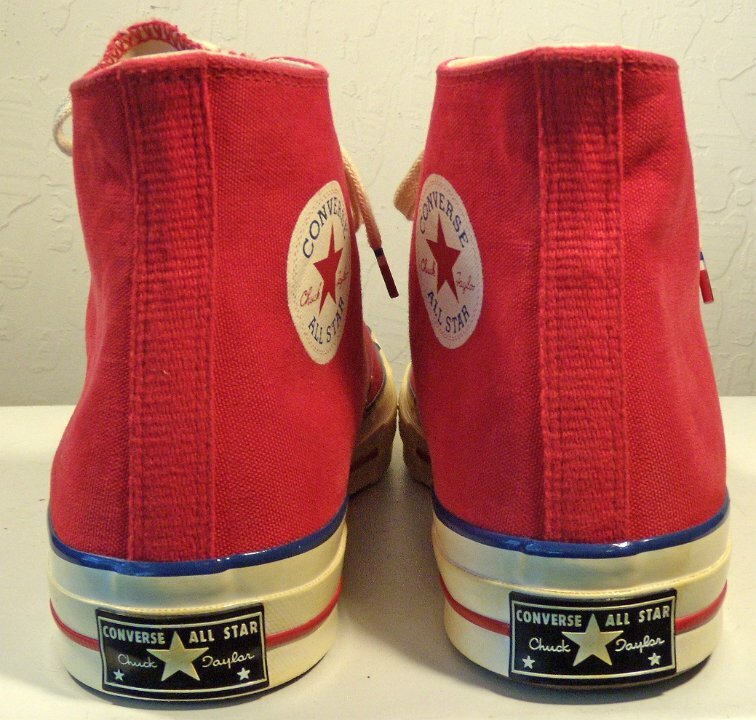 5 Red Chuck 70 Vintage Canvas High Tops Rear view of red Chuck 70 vintage canvas high tops. 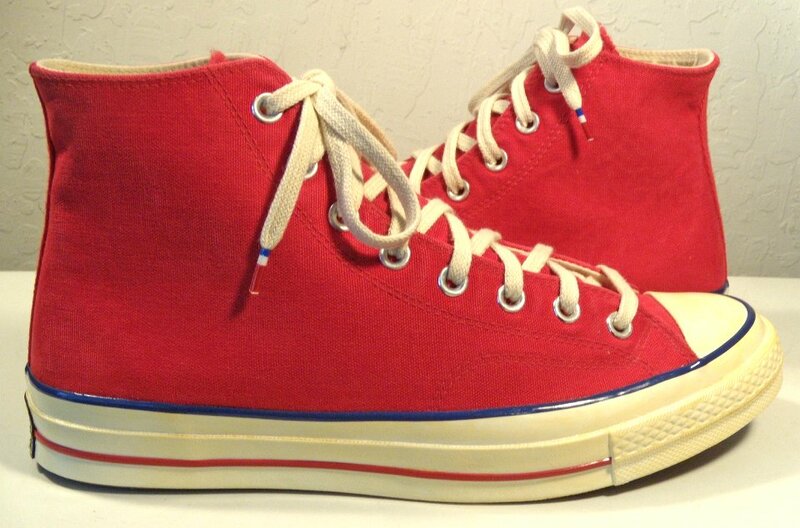 6 Red Chuck 70 Vintage Canvas High Tops Angled rear view of red Chuck 70 vintage canvas high tops. 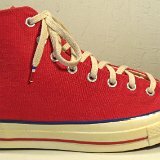 7 Red Chuck 70 Vintage Canvas High Tops Angled side view of red Chuck 70 vintage canvas high tops. 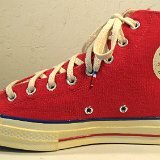 8 Red Chuck 70 Vintage Canvas High Tops Front view of red Chuck 70 vintage canvas high tops. 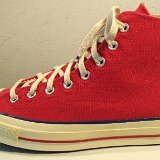 9 Red Chuck 70 Vintage Canvas High Tops Angled front view of red Chuck 70 vintage canvas high tops. 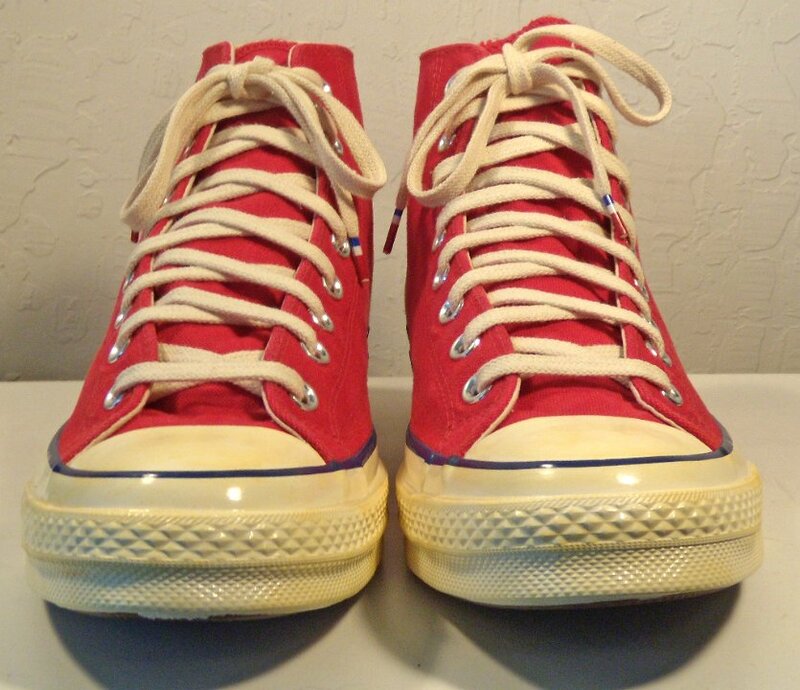 10 Red Chuck 70 Vintage Canvas High Tops Top view of red Chuck 70 vintage canvas high tops. 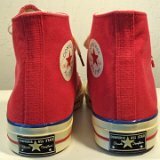 11 Red Chuck 70 Vintage Canvas High Tops Inside patch views of red Chuck 70 vintage canvas high tops. 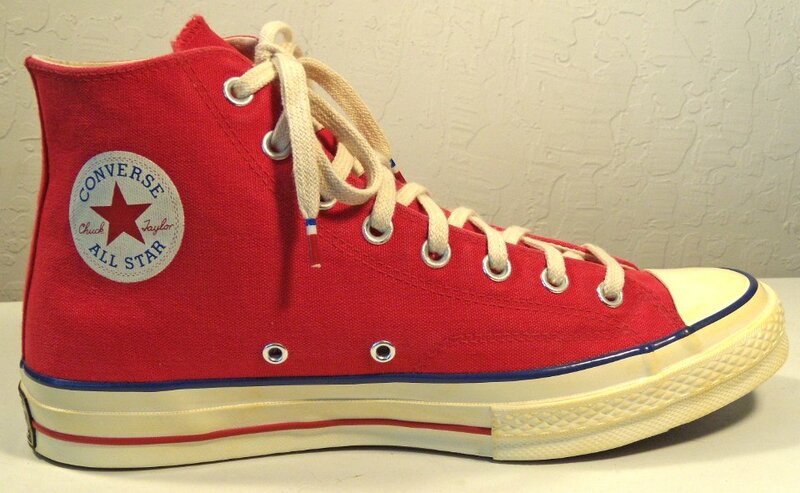 12 Red Chuck 70 Vintage Canvas High Tops Outside views of red Chuck 70 vintage canvas high tops. 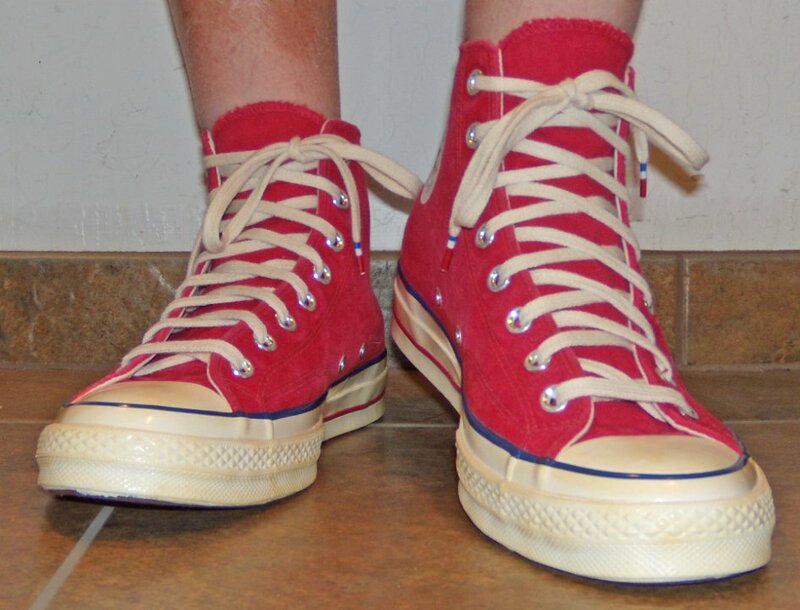 13 Red Chuck 70 Vintage Canvas High Tops Inside patch and sole views of red Chuck 70 vintage canvas high tops. 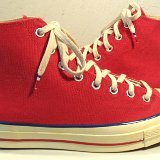 14 Red Chuck 70 Vintage Canvas High Tops Insole closeup view. 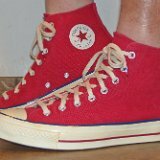 15 Red Chuck 70 Vintage Canvas High Tops Wearing red Chuck 70 vintage canvas high tops, front view 1. 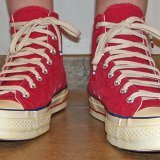 16 Red Chuck 70 Vintage Canvas High Tops Wearing red Chuck 70 vintage canvas high tops, front view 2. 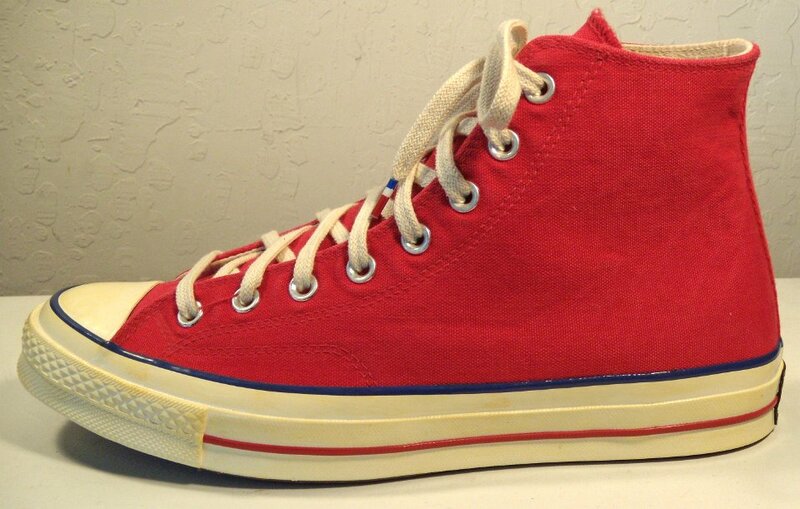 17 Red Chuck 70 Vintage Canvas High Tops Wearing red Chuck 70 vintage canvas high tops, right side view 1. 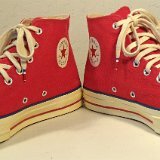 18 Red Chuck 70 Vintage Canvas High Tops Wearing red Chuck 70 vintage canvas high tops, right side view 2. 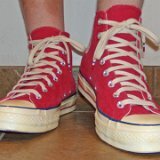 19 Red Chuck 70 Vintage Canvas High Tops Wearing red Chuck 70 vintage canvas high tops, right side view 3. 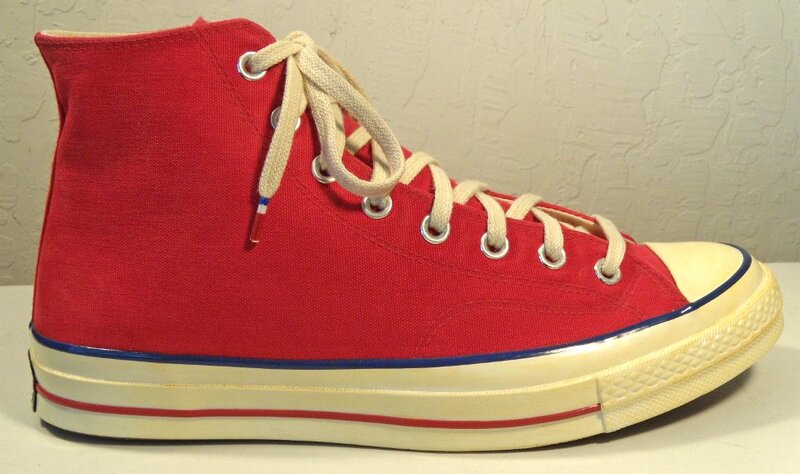 20 Red Chuck 70 Vintage Canvas High Tops Wearing red Chuck 70 vintage canvas high tops, rear view 1. 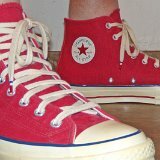 21 Red Chuck 70 Vintage Canvas High Tops Wearing red Chuck 70 vintage canvas high tops, rear view 2. 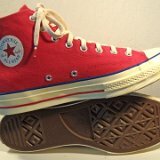 22 Red Chuck 70 Vintage Canvas High TopsRed Chuck 70 Vintage Canvas High Tops Wearing red Chuck 70 vintage canvas high tops, left side view. 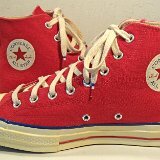 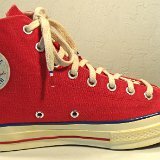 Red Converse Chuck 70 Vintage Canvas high tops were first issued in 2018. 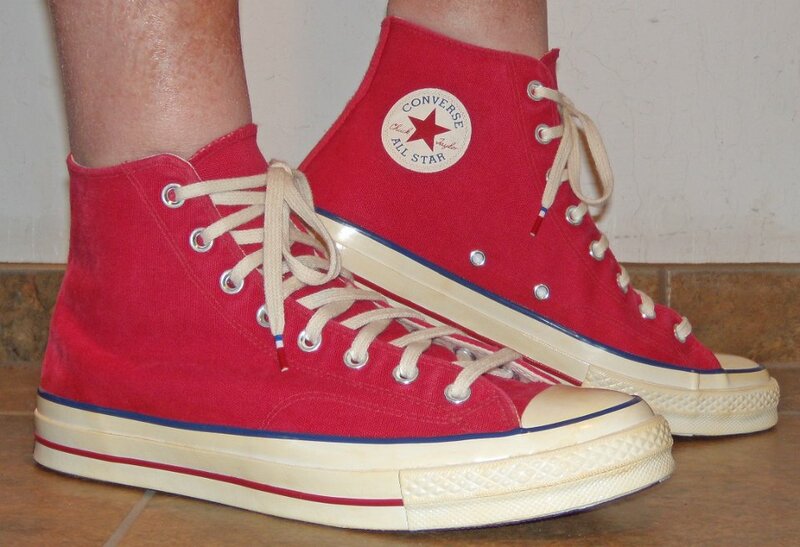 The sneakers follow the manufacturing standards of the 1950s and 60s with some variation in the details. 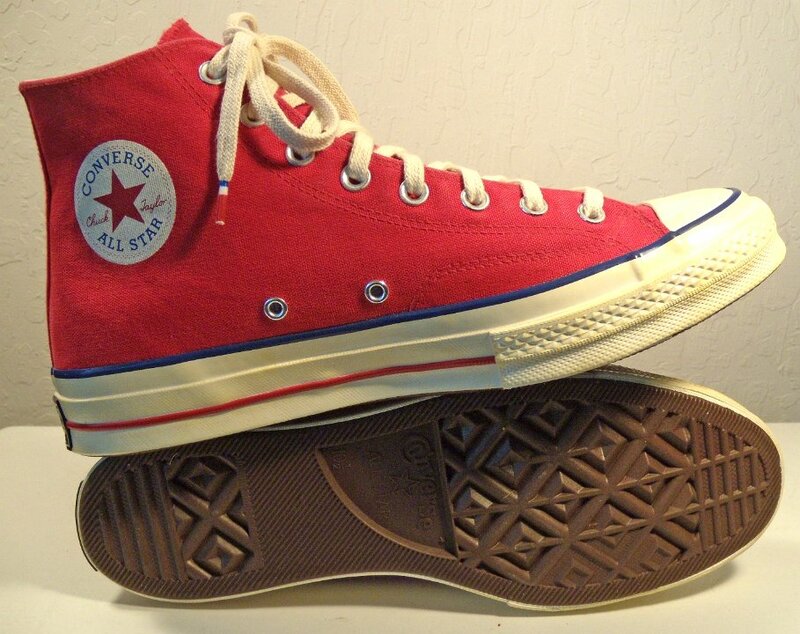 The red canvas uppers use a slightly thicker duck canvas. 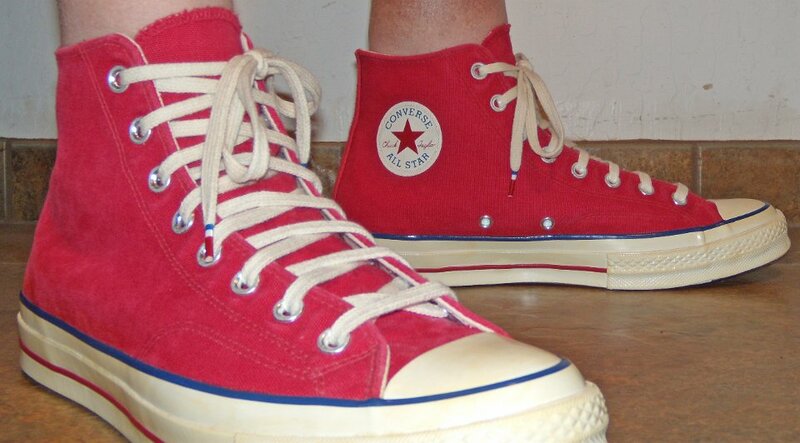 The threading is all red, unlike vintage pairs that had both red thread on the ankle support piece and white thread on the uppers. 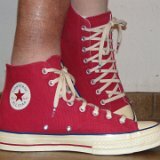 The ankle patches are also different, being all red on a white background. 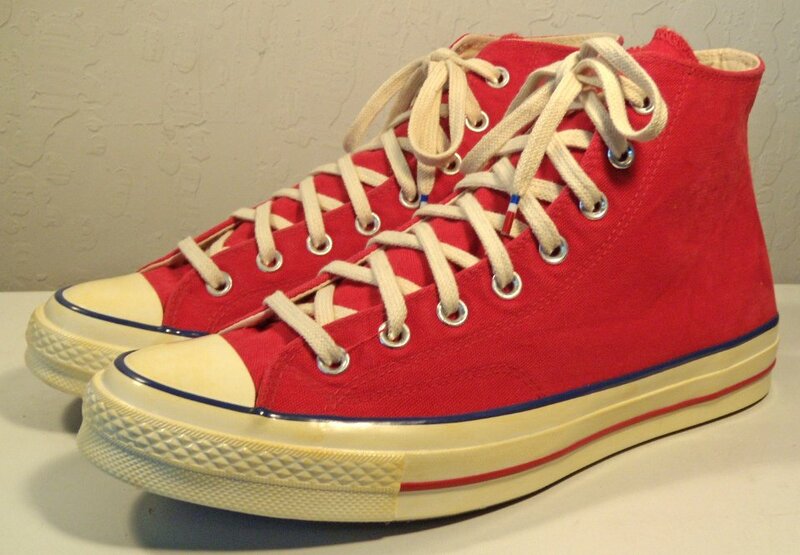 The outer foxing is made in an off white color, and this model has both blue and red racing stripes. 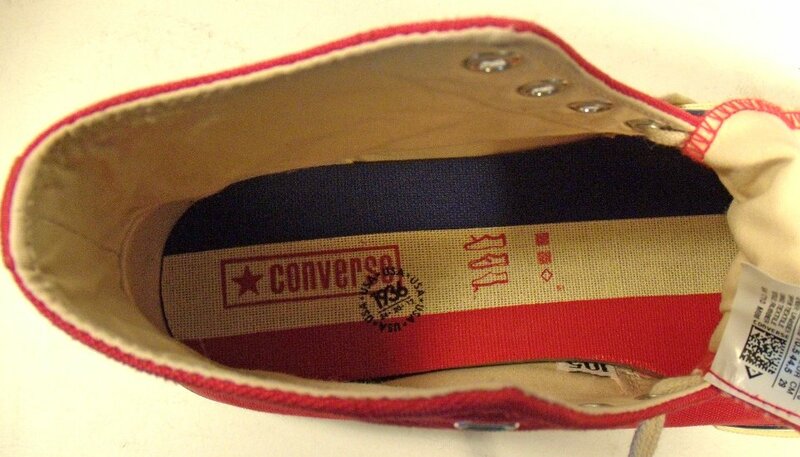 The heel patch is the vintage black and white version but made with white embossment for the lettering and the star. 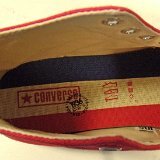 The inner sole has red, white, and blue stripes in addition to the Converse name. 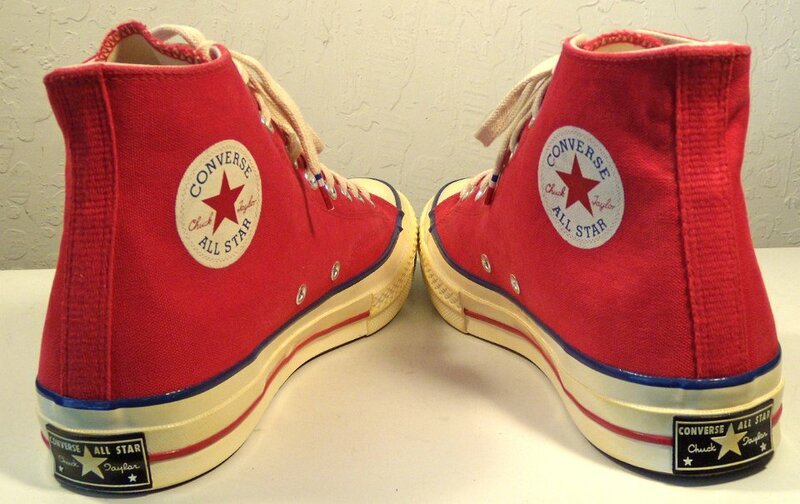 The inside canvas is natural and the shoes have the player's name space underneath the tongues of each shoe. 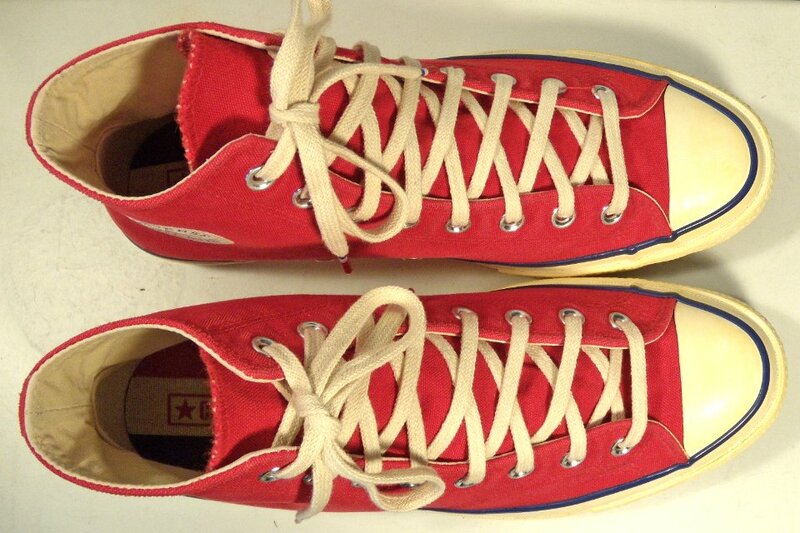 The shoelaces are thin tubular off white in color and have a red white and blue aglet on each end.